The United States Congress designated the Agassiz Wilderness (map) in 1976 and it now has a total of 4,000 acres. All of this wilderness is located in Minnesota and is managed by the Fish and Wildlife Service. The Agassiz Wilderness lies within the 61,500-acre Agassiz National Wildlife Refuge. The Agassiz Wilderness is an important breeding and resting area for migratory birds with habitat management focusing on waterfowl, marsh, and grassland bird species. The Wilderness area contains wetland habitat and lies in the aspen parkland transitional zone between the coniferous forests to the north and east and the prairie pothole region and tallgrass prairie to the west and south. This rich diversity of habitats supports 300 bird species, 50 mammals, 12 amphibians, and 9 reptiles. 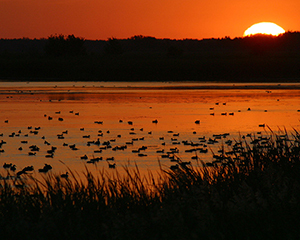 Bird watching in spring is spectacular when ducks are in full breeding plumage, bald eagles are on their nests, and secretive marsh birds are singing from thick marsh vegetation. Year round wildlife lovers can hope to catch a glimpse of gray wolves, moose, black bear, or bobcat. Hunters arrive in November to pursue white-tailed deer and grouse. Temperatures range from 59oF to 81oF in July and -4oF to 16oF in January. "Flat" best describes Agassiz, where the terrain elevation rarely varies more than a foot per mile. The Wilderness sinks as low as 1,140 feet above sea level, then "soars" to 1,149 feet. Black spruce and tamarack tower over the soft, spongy forest floor where clusters of pitcher plants and lady slippers bloom. There are two natural boggy bodies of water-- Kuriko and Whiskey Lakes. The only authorized public access to the Agassiz Wilderness is during the deer and grouse hunting seasons. There is no camping allowed anywhere in the Agassiz Wilderness. If you want to pitch a tent, head for one of the two primitive state-managed campgrounds adjacent to the Agassiz NWR. Planning to Visit the Agassiz Wilderness? How to follow the seven standard Leave No Trace principles differs in different parts of the country (desert vs. Rocky Mountains). Click on any of the principles listed below to learn more about how they apply in the Agassiz Wilderness.